BERLIN—Germany is facing a budget shortfall of around 25 billion euros ($29 billion) by 2023 as an economic slowdown means tax revenues will come in below previous estimates, a Finance Ministry document obtained by Reuters showed. Global trade tensions and concern about Brexit have already prompted Germany to slash its growth forecast for this year to 1 percent from 1.8 percent previously as a decade-long boom in Europe’s economic powerhouse draws to a close. 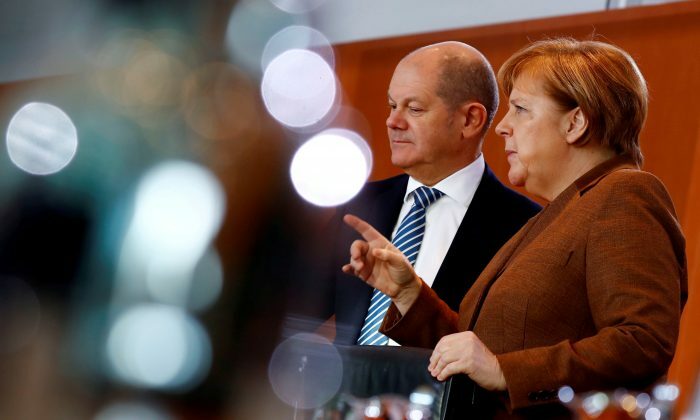 The ministry document, prepared for Finance Minister Olaf Scholz to present to cabinet colleagues, pointed to annual budget shortfalls of 5 billion euros through to and including 2022. “This is a wake-up call to colleagues that the times of constantly making demands without having covered checks are over. Now, it’s time for budget discipline,” Deputy Finance Minister Bettina Hagedorn told Reuters. The prospect of budget deficits represents a dramatic deterioration in the finances of Europe’s biggest economy, which reported a budget surplus for the federal government of some 11 billion euros last year. The document highlighted further risks for the budget, including costs related to exiting coal power. Allies of Chancellor Angela Merkel, who leads a ruling coalition of her conservatives and the center-left Social Democrats, have been pressing for the government to lower the tax burden for the rich. Both Merkel’s conservative bloc and the Social Democrats are seeking to energize their rank-and-file and win back voters ahead of European and regional elections starting in May. Scholz, a Social Democrat, urged ministers to make savings. “Investments will be carried forward at the 2019 level,” the ministry document read, adding that personnel costs would be frozen. Merkel’s cabinet is expected to discuss the 2020 draft budget and the midterm financial planning until 2023 on March 20. The government’s tax estimates will be updated May 9.